I am looking for a name to be put on this tug. 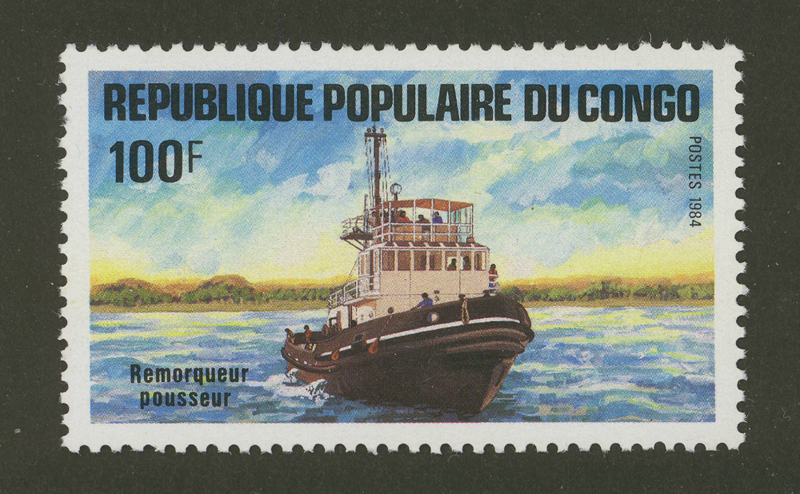 It is a French-desgned and built tug but I cannot figure out what it is doing in a Congo stamp - since to my knowledge a tug of that design never operated in the Congo. Till so far not identified, but it is on a stamp of Congo (Brazzaville) a former French colony. There is an other tug on a 150f stamp in the same set, also not identified. I do not have the stamps. It seems that I was thrown off the track by the wheelhouse windows which seem larger than they actually are in relation to the superstructure height. It therefore looks that the tugs is MAYOMBE, 1800 hp, which was built in 1974 by the French shipyard Francaise de l'Ouest, St. Nazaire, under hull nr 118. Owner is listed as Agence Transcongolaise des Communications. 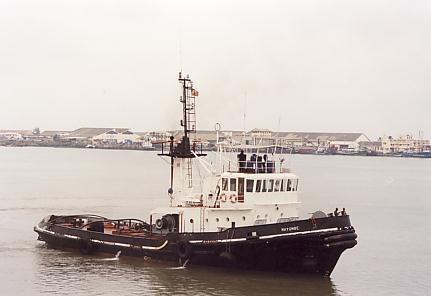 The tug is working in the port of Pointe Noire. 324 GT, 34,5 (oa0 x 9,2 m. On the website of the Port Autonome de Pointe Noire is a small photograph ogf the tugboat base, showing three tugs clearly: NANGA (or Manga), an unnamed vessel which must be HINDA, and MAYOMBE. Mayombe is the only one with a box-like wheelhouse, which was the hallmark of a French tug designer. Mayombe had it navigation mast integrated with the funnel and also had the clearly visible radio-direction finder which Hinda lacked. Also, Hinda's mast was fitted at the aft end of the wheelhouse. There is, however, one difficulty: the white strake on the hull continues aft uninterrupted. The bulwarks also show one step to the main deck. This conforms to Hinda. Mayombe's white strake was stepped ondce, while bulwarks have two steps. One other thing are the wheelhouse skylight windows. On both Mayombe and Hinda they are not visible in photo's, but the photos show them as having been covered with plating. Conclusion therefore must be this is Mayombe with an inaccurate hull form, or there must have been a close sister. Built in 1974 by Soc. des Ateliers Francais de L'Ouest, St. Nazaire, #Rd18 for L'Agence Transcongolaise des Communications, Pointe Noire, People's Republic of Congo. Tug, Gt:324, Nt:54, Dw:279, Loa:34,50m. Lbp:29,90m. Br:9,20m. D:4,75m. Drauhgt:4,52m. 2-12 cyl. Soc. Alsacienne de Constr. Mec. (SACM) Mulhouse:1324 kW. 13 kn. IMO.7347859. Last edited by D. v. Nieuwenhuijzen on Thu Nov 13, 2014 1:25 pm, edited 1 time in total. the amount of money warming up is certainly created regarding by just.